Crafted in contemporary 9ct white gold, these charming heart-shaped stud earrings are set with glittering set cubic zirconia for a stylish finish. Embodying girly glamour with a refined edge, this irresistible piece is perfect for adding a touch of luxe to any ensemble. 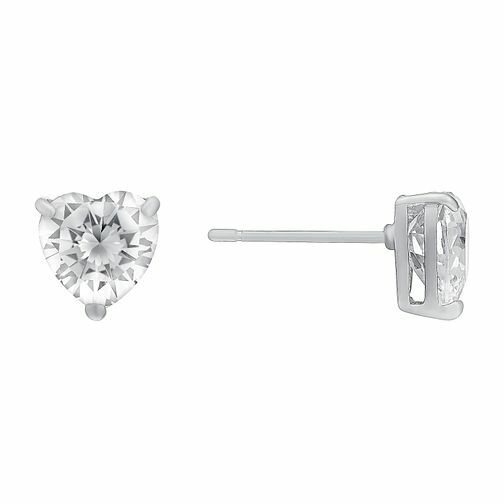 9ct white gold heart-shaped cubic zirconia stud earrings is rated 3.0 out of 5 by 2. Rated 5 out of 5 by Anonymous from Lovely earrings, very pretty A great birthday present for a relative, very pretty earrings.